Abby Stern is the author of the new novel According to a Source. She has worked as a freelance celebrity reporter in Hollywood; her work has appeared in various publications, including People magazine. Q: How did you come up with the idea for According to a Source, and for your character Ella? Did your own experiences working in Hollywood factor into the story at all? A: When I first started freelancing for a celebrity magazine and would tell friends both in and out of LA what I did, they were intrigued and asked me a million questions. They couldn't believe I got to go to parties and red carpets to interview celebrities and would sometimes get to hang out after. As I became more immersed in that side of the industry I got to know other people who did different things at magazines and in my gut I felt like there was a really fun story to tell. 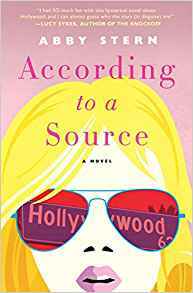 I was a huge fan of The Devil Wears Prada and thought the same kind of narrative could work for a Holllywood story so I sat down and started writing. There is definitely some of me in Ella, good and bad. It's more of the younger version of me. People don't approach decisions they make in life ever intentionally trying to do the wrong thing, but they do. And people aren't always likeable. I wanted to make sure Ella was more real and grounded than anything else. As far as if my experiences made it into the book, the book is all fiction but it's definitely inspired by some things I've seen or heard and then I took all of that and used a lot of creative license to craft an interesting story. Not everything that's based on a kernel of truth would make for an interesting novel so I had to divorce myself of the notion of only writing things how they would happen in real life for the sake of the story. Q: Do you see Ella's story as an only-in-Hollywood plot, or could it take place somewhere else? How important is setting to you in your writing? A: Of course most of Ella's story here has to do with Hollywood but I do think that her journey has a relatable message for anyone who lives anywhere. As I said above, characters and people in real life don't always do the right thing. They want to or think they are but they rationalize decisions and behaviors to themselves that they know deep down aren't the best choices. Ella is a messy character. She makes mistakes and she has to face the consequences and figure out how she can attempt to make amends to the people she's hurt. No matter where you live or what your profession is, I think we can all relate to that as fallible human beings. For According to a Source, the setting was important because of that push and pull Ella has between Hollywood and her real life. I do think that setting and external factors have an effect on characters no matter what the setting is. This one for me was a particularly fun one because of all of the glitz and glam but also because of that it's really important to have grounded characters. I never had to work on the story being "fun" because of the setting but I wanted to make sure that it was a story that focused on characters instead of namedropping LA landmarks. Q: What did you see as the right blend between humor and seriousness as you wrote the novel? A: I never had in mind that I want it to be 70 percent fun or 30 percent serious. Again, I had to let the characters drive the story. Sometimes, just like in life, you're in the middle of some really dark moments and there's levity. Or you can be on cloud nine and have your world come crashing down. I'm a fairly witty person, always throwing a joke into everyday conversation, so I definitely infused that into According to a Source but the ratio of seriousness to humor always came from the characters instead of something I was trying to orchestrate as the author. Q: Did you know how the novel would end before you started writing, or did you make many changes along the way? A: When I first sat down to write the novel, no. I was trying to let it flow out of me and wrote a first chapter that doesn't even exist now. I truly had no idea where it would go but I knew that I was having fun with it and that the people that I showed it to were responding well. I probably didn't start to think about the actual story arc until I'd written about 80 pages. Then it was time to stop writing fun stories for the protagonist and start to shape it into a novel. Once I got into that mindset, I knew there were a few major plot points that had to happen for the sake of structure and when I figured out what I wanted those to be I was able to fill in the gaps. That's not to say that there wasn't a lot of revising and editing but I'd say that the final version is very close to the vision I had when I began to conceptualize the novel. A: I'd love for According to a Source to become a TV series so I'm working on that. There's so many fun situations that didn't fit in with the narrative of the novel and I'd love for people to be able to see Ella handle them. I'm also working on a bunch of other TV projects and have some ideas for books in other genres I'm fleshing out and researching. I think that Ella's story is nicely bookended here for now but I think it could be fun to explore Holiday's character more in a spinoff. A: My dream job is to write for Last Week Tonight with John Oliver or to work with Nancy Meyers.